Education is one of the pillars of Cargill's community giving programs. Above, students from the Phu Hoa Kindergarten. 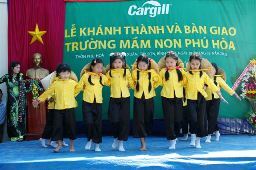 BINH DINH Vietnam � 1 April 2013 � Cargill today unveiled the Phu Hoa Kindergarten in Tay Son Binh Dinh province under the umbrella of Cargill Cares, an ongoing employee-led initiative which began in 1997. The new kindergarten brings the total number of Cargill Cares Schools in Vietnam to 58, underpinning Cargill's continued commitment to the communities in which it invests. The Phu Hoa Kindergarten valued at VND1.4 billion (US$65,000) will benefit 200 students from low-income families whose lives Cargill hopes to enrich through early childhood education. Fitted with three classrooms, a staff room, utilities and a kitchen, the children will be taught basic skills like reading, spelling and counting, and engage in fun group activities. Education is one of the pillars of Cargill's community giving programs. The company strives to provide access to kindergarten and primary education for children from low-income families in rural communities. Cargill has a long-term goal to build 75 such schools in Vietnam by 2015 to educate some 17,000 students. So far, Cargill's employees, suppliers and customers have raised VND63 billion (US$3 million) that has enabled more than 13,000 Vietnamese children to attend schools built by the company in 41 provinces across the country. “Cargill Cares Schools demonstrates our pledge to investing in the education of these rural children who are the key to the future. We will continue to work with Cargill employees, and Cargill Cares Councils to implement our educational initiatives in rural Vietnam, ” Chanh Truong, country head of Cargill Vietnam said. “We are grateful to Cargill for its commitment in setting up Phu Hoa Kindergarten. The kindergarten is the first step in paving the way for our students to succeed, ” said Tran Thi Dua, principal of Phu Hoa Kindergarten. In February 1995, we established our presence in Vietnam with the opening of our first representative offices in Hanoi and Ho Chi Minh City, and Cargill Vietnam Limited was formed. In December 2009, we were the first U.S. company to obtain a distribution license in Vietnam, allowing us to distribute products directly in the country. We employ over 900 employees across 15 locations. Our operations include animal nutrition, cocoa production, food and beverage ingredients, grain and oilseed trading and marketing, and metals trading.